Kelsey Plum became a one-woman show against Utah Saturday, scoring 57 points to become the NCAA’s all-time scoring leader. Photo by Mike Houston/T.G.Sportstv1. 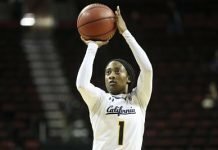 Each week, a five-member womenshoopsworld.com panel votes to determine the best collegiate player of the preceding week. 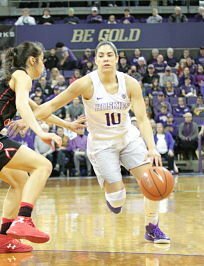 Kelsey Plum entered the week of Feb. 20-26 needing 78 points to tie Jackie Stiles’ 16-year-old NCAA all-time leading scorer record. The Washington senior guard ended the week with 81 points. She is the new Division I career points leader, and she is WomensHoopsWorld’s player of the week. Plum has made it a habit to put up ridiculous point totals in a game, as she’s averaged about 30 per contest all season long. But against Colorado Thursday, Plum had a “slow” night, scoring 25. The points record looked attainable in the Pac 12 Tournament, which begins March 2. In Saturday’s match up against Utah, however, Plum did what she had to and stepped up when center Chantel Osahor got in foul trouble. The scoring display that ensued was a thing to behold. As has been the case throughout her storied career, Plum seemed undefendable, as she continually found and created new scoring opportunities. Coach Mike Neighbors said his team “needed every one” of Plum’s points, and indeed, the Huskies won by only seven, 84-77. As a result, they head to the tournament this week seeded third. Plum has been a player for the ages, and she still has more games to play this season.